New Zealand’s merry little band of climate deniers are turning out to be a right bunch of Cnuts. 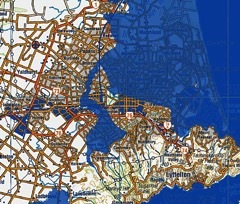 Sea level rise and its implications for Christchurch and the wider world have been making news in recent weeks — as have new projections of rapid sea level rise over the remainder of this century. So what does a good climate denier do? To stay faithful to their core belief — that climate change isn’t happening, or isn’t going to be bad — they have to argue against policies designed to deal with its impacts, as well as those intended to cut carbon emissions. Sea level rise? Like Cnut, they line themselves up against the waves. Based on a 2014 report (pdf) from consultants Tonkin & Taylor. Treadgold’s most recent infelicity is to call James Hansen a “loony“. Treadgold affects to address him as “professor” de Lange throughout his piece, but he is nothing of the sort according to his Waikato University web page — he’s a senior lecturer. It’s worth reading this very good overview on the question by Andrew Glikson at The Conversation.